oomph. : a week of summer whites. textures 02.
tropical storms, hurricanes, earthquakes, and flash flood warnings...we got it all. with the hurricanes expected to hit this weekend, people are going crazy stocking up on water, canned goods, gasoline, etc., and as a result of that some greedy retailers have jacked up the prices on these necessities. $17-$30 for a case of water...are you f@cking kidding me? way to help us out in time of need! as of right now, my 9-miler (race) is still on for sunday. we won't know until saturday night if it will be cancelled due to the weather. i can't believe i'm saying this, but i'm hoping it's NOT cancelled. this particular race covers the mid-section of the marathon course - the hilly part - so i'd love to see what i'm in for for the marathon. playing with textures again; a silky white top + lace shorts. how did/do you prepare for it? everyday low price my a$$! love the little peek-a-boo top! I'm featuring some modern cheongsams today on the blog if you're interested since I don't think I've seen you in one yet~ :P Stay safe over the weekend and if your run goes on, good luck! Super cute outfit! That's insane about the water! You guys stay safe and hopefully it won't be bad at all and the storms will just skirt on by. Your outfit is so beautiful. I love the feminine details. 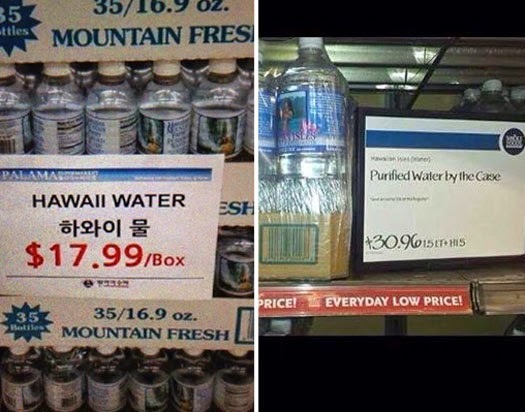 I cannot believe they have increased the price of water so much. The cases of water I pick up here several times a weak for my house are only 4-5 dollars. I hope the hurricane missing you. Stay safe. I'm dying to find a fresh and crisp shirt like that. Love how you mixed textures! Gosh I hope everything is ok. Sounds very stressful. Loving the outfit, beautiful top. OMG stay safe!!! And, yes, how RUDE of the retailers! Have a heart much? I really hope the hurricane passes you by. I love this white outfit the best of the week . . . but most of all--STAY SAFE!!! Cute look! I can't believe they're price gauging!!!! It's against the law in my state. Stay safe doll! Totally love this combo especially the open back top. Malaysians are very lucky to be sheltered by many natural disasters. The only one that we face occasionally would be flash flood. If we have a day of continuous rain, and with poor drainage system, we will tend to have floods in the city itself. Besides that, we're pretty good. Glad you guys dodged them! That's a SIN to charge you guys $17-30. So crazy Becks!!! Your outfit is pretty!